Technology is the backbone of all business irrespective of the size and the capital. 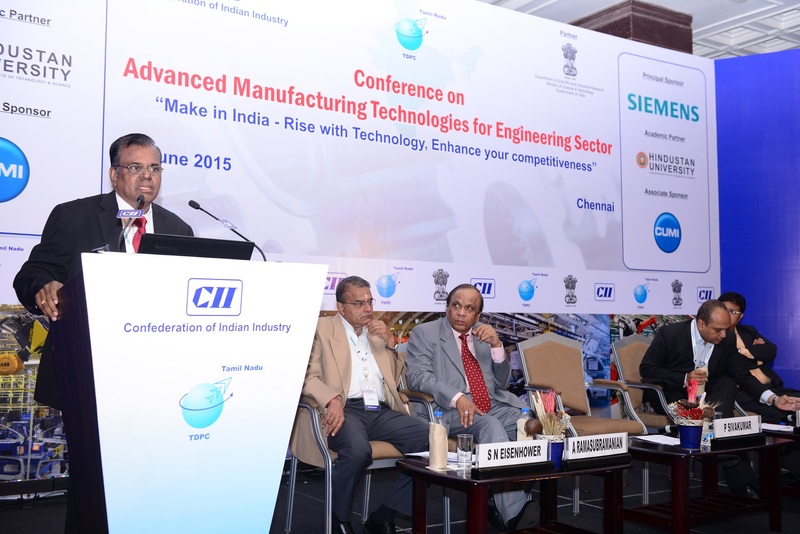 In auto industries lots of trends are emanating and the technology has to be underpinned in all phases of manufacturing, said Dr P Sivakumar, Director, Combat Vehicle Research & Development Establishment, DRDO, Ministry of Defence, Government of India at the inaugural session on ‘Advanced Manufacturing Technologies for Engineering Sector’ organised by Tamil Nadu Technology Development & Promotion Center of CII. The conference with a theme “Make in India – Rise with Technology, Enhance your competitiveness” endues right choice of engineering and envisages right mix of advanced technologies to redefine the industry with a commendable round of hit in engineering sector. Dr Sivakumar further said, the government of India has also taken several initiatives to promote auto business in India. Some of the highlights include increased investment in R&D and reduction in excise duties. The latter is applicable not only for auto industries but other industries too. FDIs are encouraged in auto industries to an extent of 100%. There are several establishments of automotive training institutes and auto design centers which hone the tender brains to be technologically trained in automobile intricacies. Special auto parks and virtual SEZs are also in the cards of Government’s expedients to drive Make in India. To paraphrase, Make in India will realize with the under mentioned four salient driving factors effectively merge with the action steps. Getting infrastructure execution right, driving labor reforms, Ease of doing business and building an export eco system are the four aforementioned factors. 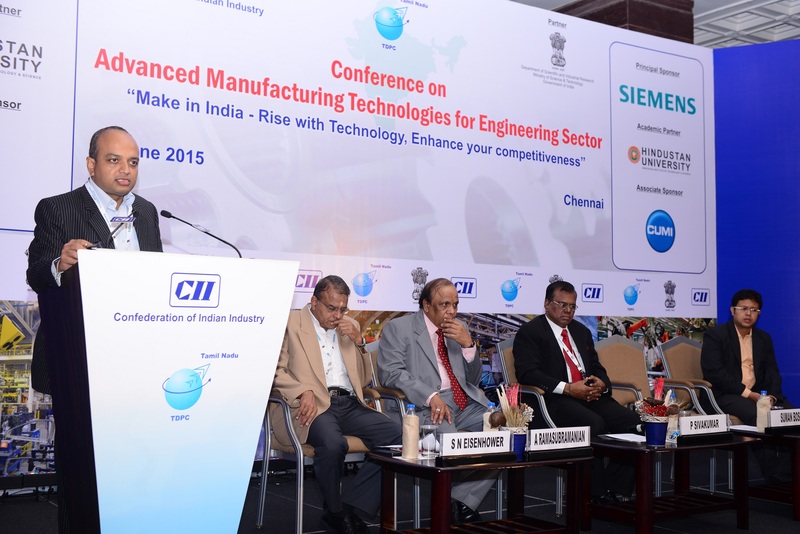 There are various reasons underscored for India to flag its leadership in the engineering sector. The country is the best spot light as an emerging global hub for sourcing auto components. The geography also supports India as it is very closer to key automotive markets like ASEAN, Japan, Korea and Europe. India is considered as the 4th largest producer of steel in the world. Unambiguously India is in the hot seat estimated to become the 3rd largest globally by 2018 accounting for 5% in vehicle sales. Also it has been projected that India will be the 4th largest automobile producer by 2020 globally following US, Japan and China. This is an ardent sign across globe for all auto players to have their physical establishment and support make in India. The working populace in India is enormous which is a key driving factor to have industries get their work done without any impediments, said S N Eisenhower, Chairman – CII Tamil Nadu and Director – Operations, Saint-Gobain Glass India Ltd. Prior to 1985, cost effective manufacturing was the mantra which was pursued and the need for safety was oblivious. Post 1985, when India has announced its liberalisation and when Maruti Suzuki started trialing its operations much of wakefulness started hitting the Indian minds. The entire industry has gone on a paradigm shift and the brand has roofed almost the market with traces left for other players. But slowly when the market turned opportunistic, fellow players have started inflowing the market with their brands. India has become a potential market then on. Now the manufacturing operations hit the necessity of technological reformation and the auto players are ready to invest in India and it has become imperative to corner the red tapism and unfold the red carpet with minimum statutory checks and supporting single window clearance. The market is ready with welcome board for the ‘survival of the fastest’ players replacing the traditional saying survival of the fittest players, added Dr Ravichandran. Navy also has joined hands with Make in India promotion and the planning is in place from table to commissioning. Naval requirements for ship building and the Government provisioned industry supply should be synergised. The power generation and transmission has to be ultimately in line with the requisite standards. Army and Air Force also follow the same commissioning and the requirement specifications should match the government standards. Reaction has become meaningless as everyone tends to be proactive. It has been divulged that certain technologies have become inevitable factor to implement in the warships to mitigate the conundrums of rival attacks. Arjun main battle tank is one of the war ships that use nano technology. The laser scanner inside the ship acts as a sensor to identify the requisites and plan the propulsion. This advanced manufacturing technology is synonymous with the cost of operations and the proportionality can hardly be shunned. The speakers also lauded that electric vehicles now has peeped-in the market. The emission norms have become highly rigid that the vehicle has to be restructured to support light weight mantra. Aluminum to steel, magnesium, titanium, metal matrix composites are some of the alternates being suggested for clinching the light weight. Advance ceramics for sealing, metal matrix composites for braking components should be tapped in order to support emission control in the market. The usage of electric vehicles will decrease the oil burden and increase the energy security and also promotes green environment. Like the advantages specified using electric vehicles there are shortcomings too with respect to its manufacture. The electric battery is a very big challenge where lithium ion has to be made imperative for electric vehicles. The manufacturing of Lithium ion is a herculean task and loads of ground work should precede the major move. The ideas are now getting pondered and the decision with regards to manufacturing will be mulled over. Industry could still serve better if the graduates are market ready. The highlighted shocks in the conference were 47% of graduates are not employable and 70% of engineers are not employable. This is because of the conventional curriculum based teaching model adoption against the outcome based teaching model. Dr D Dinakaran, Professor (Mechatronics), Head – Centre for Automation and Robotics, Hindustan University opined that “Gears are enough but the required shaft power is not pulled out. The education should be no more in the conventional model but outcome based model. The technology in innovation has touched its summit with the advent of virtual setup prototyping and the credit goes to Epson. Nobody could imagine an industrial set up in a cubicle and Epson does it. The expected next gen dual arm robot will be market ready by March 31 2016. The operations in any manufacturing could be effectively carried out with the virtual setup with minimum human intervention. Multitasking is not a question of do ability if robots hit the industry floors. A small change in program can train the robot with different activities and huge economies of scale could be achieved on careful insights. But it does require huge investments too.